" Great stuff! It gets rid of the bad smells in the mask and hose and my sinuses are much better. " 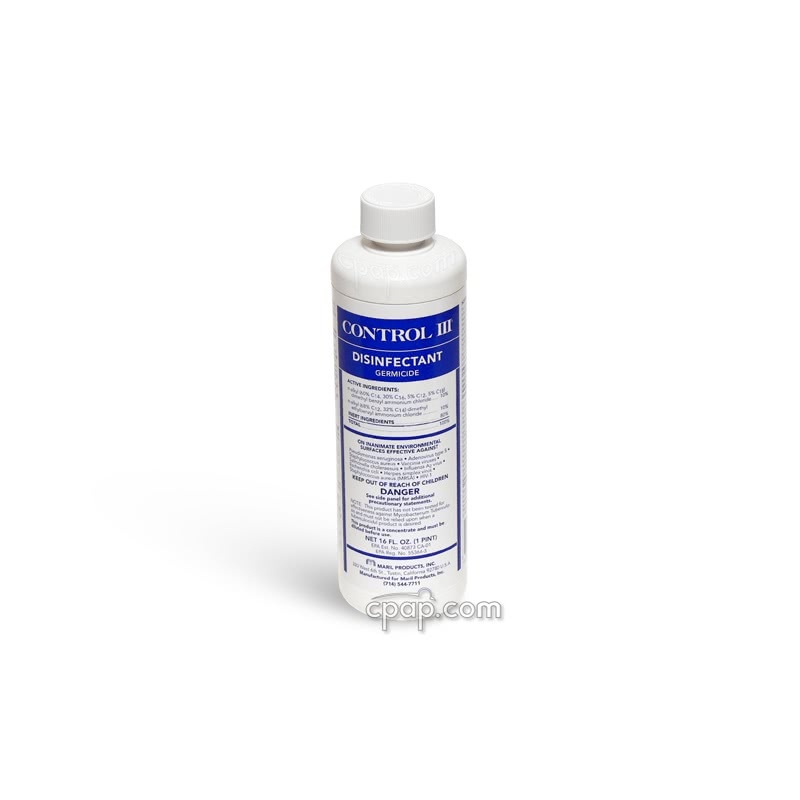 Control III Disinfectant CPAP Cleaning Solution - 16 oz Concentrate is a concentrated disinfectant and germicide formulated for use on pre-cleaned surfaces and is used extensively in sleep labs and hospitals. 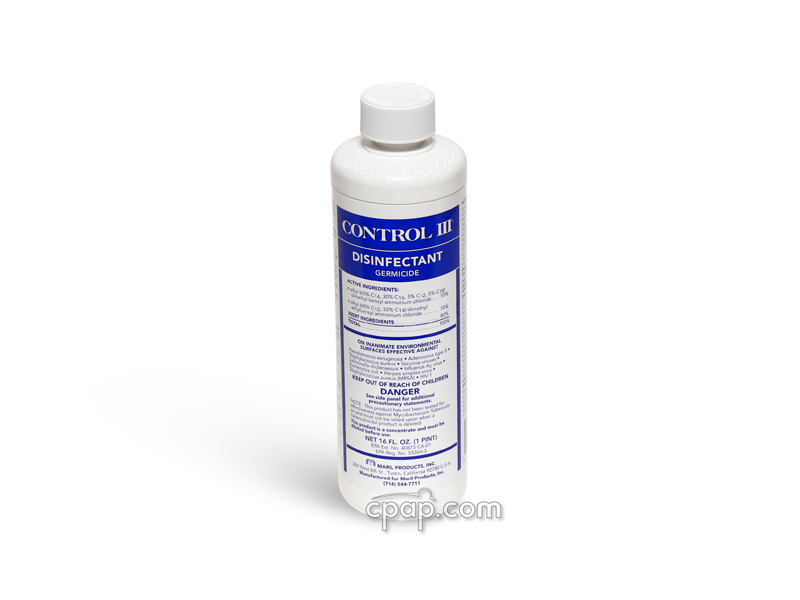 Using the Non-Critical Disinfection solution (1 ounce per gallon of water), Control III can be applied to disinfect and clean CPAP equipment and accessories against H1N1 (Swine Flu). This 16oz bottle is concentrated and will make up to 16 gallons once diluted. You can store any diluted solution up to 14 days. Please read our Important Tips tab and the Learning Center tab for more information. After extensive in-house testing and comparison of CPAP cleaning products, we found this to be the most impactful, as well as the most cost-effective cleaner on the market. For instance, it is more effective and less expensive than vinegar and water. It can be used to disinfect and clean mask cushions, mask parts, hoses or tubing, humidifier chambers, etc. Since you can store any diluted solution for up to 14 days, we recommend getting a small spray bottle, follow the directions for dilution, and use the spray bottle for everyday cleaning needs. You can also store any diluted solution that has been used for disinfecting, in a small container or bucket with a lid, and re-use for up to 14 days. Items must soak for 10 minutes to actually disinfect. It is recommended to pre-clean your items first with a little baby shampoo or some other very mild soap and water before using Control III as a disinfectant. 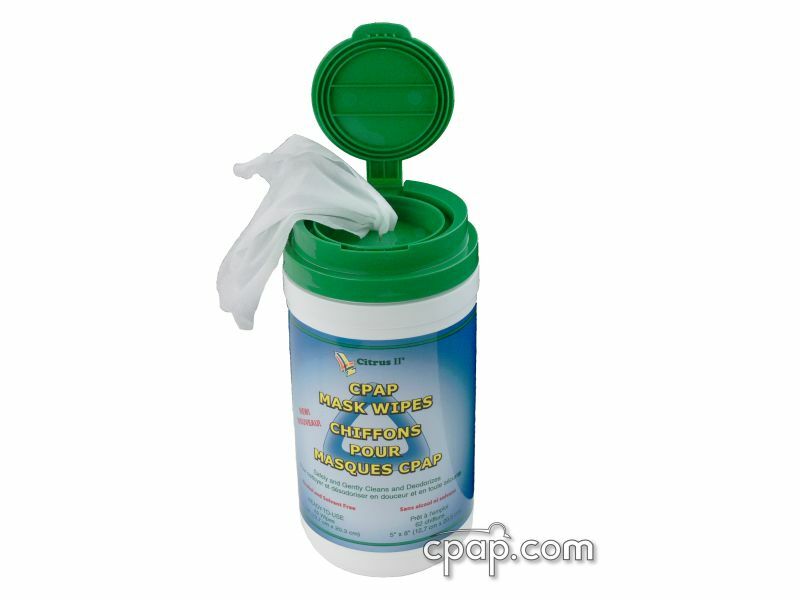 Use proper care when disposing of the Control III Disinfectant CPAP Cleaning Solution. Dilute the mixture before throwing away the container or pouring out the liquid. The water decreases the potential harmful effects of the solution. Then, rinse and dispose of the container. How long will Control III last? The concentrated form, in the original container, has a 5 year shelf life. However, once the diluted solution of one ounce of Control III to one gallon of water has been mixed, it can be used for up to 14 days. If the diluted solution becomes noticeably dirty then it should be changed sooner, even if 14 days has not passed. 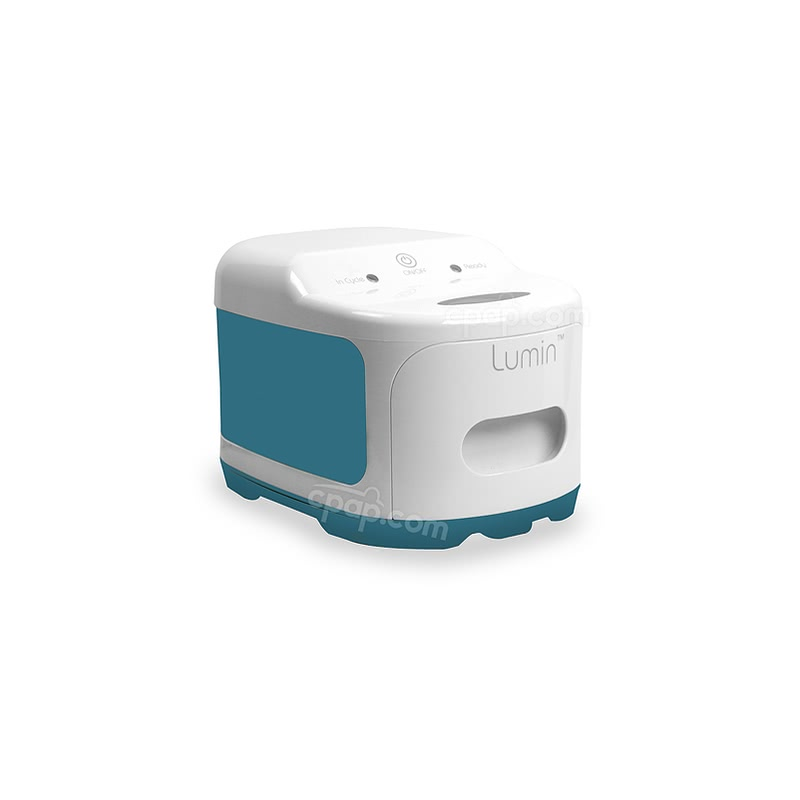 The Home Care Kit comes with Control III Test Strips which once immersed in the diluted solution will change color to indicate if the solution is still active and effective. Is Control III environmentally friendly? Yes, it is. Control III breaks down quickly when released in septic or sewer systems and does not cause harm to human, plant or animal life. Is it effective against spores? No, it does not kill any spores. 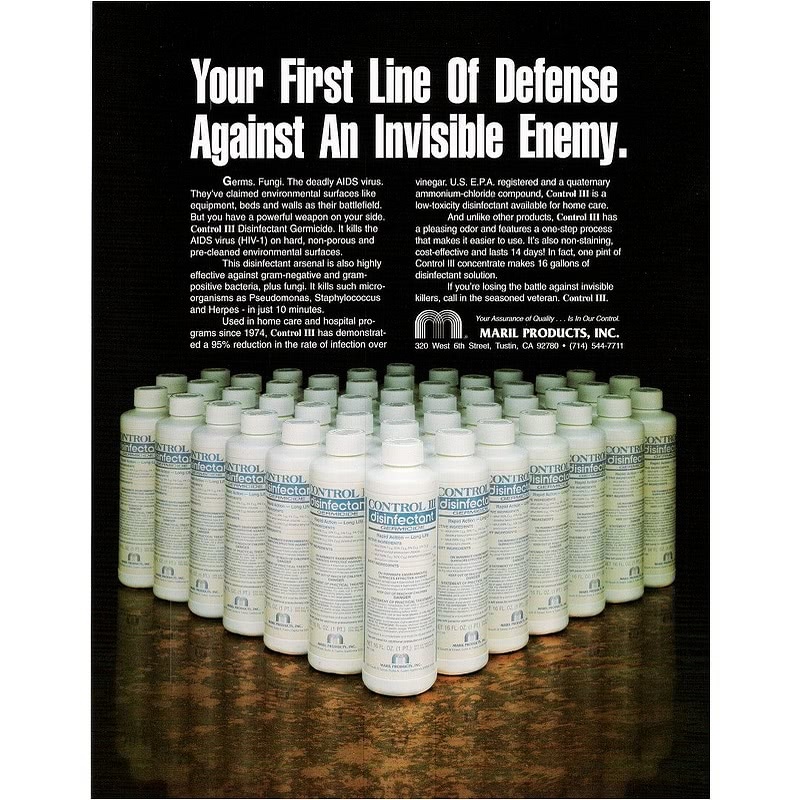 How does Control III kill bacteria without being highly toxic? Toxicity does not determine bactericidal effectiveness. The active ingredients in Control III attack the core structure of the bacterium by a chemical method of action while simultaneously having a low toxicity level. Is it effective in killing Tuberculosis? No, it does not kill Mycobacterium tuberculosis. However, it is effective against many other common bacterium. Does it irritate the eyes and skin? The concentrated form of Control III, as it comes straight out of the bottle, is a primary irritant to the eyes and skin. Direct contact of the eyes or skin with the concentrated form of Control III Disinfectant should be avoided. However, once mixed with water per the instructions, the diluted solution is not an irritant to the skin or eyes. If you do get it in your eyes, rinse thoroughly for 15 minutes with water. If redness or irritation continues, please contact a doctor. Does the equipment need to be pre-cleaned prior to disinfecting? The most vital step in the disinfection of your equipment is proper pre-cleaning. It removes the initial dirt and grime or other matter which may have caused contamination of the equipment. Once pre-cleaned, all items should be rinsed thoroughly with fresh water before disinfection. What should be used as a pre-cleaning agent? A mild detergent such as regular baby shampoo or a liquid dishwashing detergent without moisturizers or anti-bacterial ingredients should be used to pre-clean the equipment. Do not use bar or liquid hand soap. After the pre-cleanse, rinse all of the items to be disinfected with fresh water and then immerse in the diluted Control III solution. The proper dilution ratio for disinfecting home care respiratory equipment or supplies is one ounce of Control III concentrate per one gallon of water. What kind of container should be used to soak the equipment? It is recommended to use a polyethylene plastic container for the soaking required for disinfection. This type of bucket is available in the Control III Home Care Kit. When not in use, the solution should be kept in an air tight container to reduce the chance of evaporation and contamination. PVC containers are not recommended because after extended exposure to the Control III solution they may become tacky feeling. How long is it advised to soak the items for proper disinfection? The soak time required by the EPA (Environmental Protection Agency) is 10 minutes. Soaking the items longer will not provide any greater levels of disinfection but will also not cause harm to the equipment. If natural rubber or PVC materials are soaked longer than 20 minutes undesirable results may occur such as a tacky feeling to the items. This is not harmful in and of itself but is probably something that would be displeasing. Is it necessary to rinse the items after disinfecting? After a 10 minute immersion in the Control III solution the equipment should be rinsed with hot tap water and allowed to air dry. If not using the disinfected equipment shortly afterwards, it should be covered with a clean towel until use or stored in a sealed container or a plastic bag. Is Control III concentrate harmed by temperature extremes? 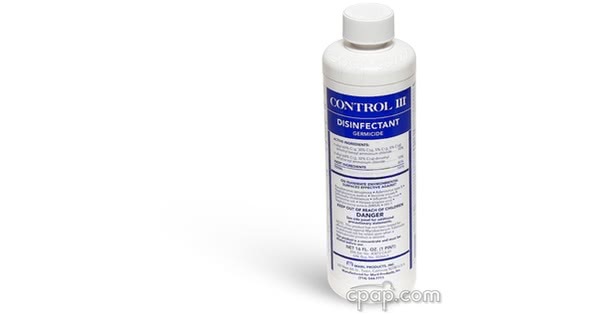 No, exposure to excessive heat or cold will not harm the Control III Disinfectant. If such exposure occurs, then naturally allow the concentrate to return to room temperature and then shake vigorously before use.